I don’t know if you have noticed this but I certainly did when I first moved to Southern California: People insist on adding the definite article “the” in front of major freeways. Turns out, it’s not just some baseless regional slang, there’s a decent amount of history behind it. 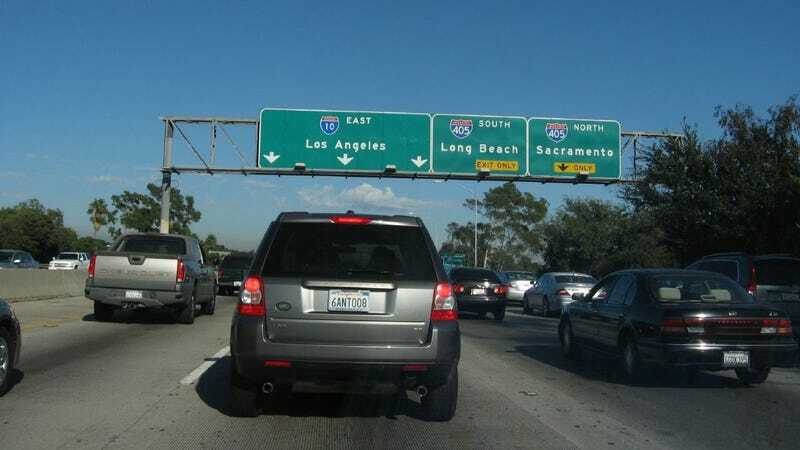 Southern California’s affinity for “the + numerical freeway name” (“the 405,” “the 110,” and “the 5”) starts way back with the fact that it was an early adapter of a freeway system, according to this 2015 story on KCET. Today, we know Los Angeles as a haven of driving and car culture—because it has been exactly that for the past few decades. Much of Los Angeles city planning in the 1920s and 1930s centered around the population’s love of cars and driving—and the traffic that resulted in it. Traffic choking the boulevards. Traffic choking the streets. There needed to be a solution for the city that devoted so much of its transportation solutions to personal vehicles. In 1937, well before the Federal Aid Highway Act was passed in 1956, the Automobile Club of Southern California published its “Traffic Survey.” In it, the Club pointed out traffic congestion problems and recommended something called the “motorway” to ease the flow. The Arroyo Seco Parkway is usually credited as L.A.’s first freeway, but a four-mile stretch of Ramona Boulevard might deserve that distinction instead. Built between 1933 and 1935 at a cost of $877,000, the highway linked downtown Los Angeles to the communities of the southern San Gabriel Valley. It offered all the features of a modern freeway except—at first—a center divider. And since the freeways were conceived to solve local traffic problems, they were partially paid for by local funds, writes KCET. Which meant that many of them had local names, usually to designate their destination: the Harbor Freeway, the San Bernardino Freeway, the Pasadena Freeway, etc. Despite the regional names, though, these highways still had multiple corresponding numerical names because of two nearly unrelated and independent highway naming systems. And as more routes were added and extended and more numbers were assigned—you can see how it would get very confusing. ... Another course of possible confusion stems from the fact that the federal government has designated some highways in California by numbers already in use by the State. The State immediately changed its numbers to avoid duplication. Again, maps now on drawing boards will note the changes. Can you imagine just trying to read the road signs for that? That meant that you could drive on a highway one week and come back and it would be a completely different number the next. This needed to change, so in 1964, the state of California underwent a massive highway renumbering process. The result was that freeways would only have one route number, like how State Route 7 replaced State Route 15 because there was an Interstate 15. Former SR 7 became Interstate 405. Slowly, people living in Southern California more or less dropped the regional names of the highways (though you can still see them on signs) and adapted saying the highway number just like everyone else in the country. But they haven’t managed to drop the “the” in front of those highway names.